Virginia has a few fabulous cards to share with you today! First up is this stunner using Stop. I love the simplicity of this paired with the dazzle of the embellishments! I think all stop sign poles should have glitter strips on them! Who's with me?! She is my Idol when it comes to blown alcholol inks!! We're eagerly awaiting this morning's announcement of the top 15!! I love how she created the double chevron pattern. To cover up the "loose ends" she fussy cut the flowers and positioned them over. Virginias cards are amazing.. love how different each card is.. great designing..
Gorgeous, that second one is ah-may-zing! LOVE! Darling cards. and yes, I think all stop signs should have bling on them. I just LOVE how Virginia played with her CAS-ual Fridays stamp sets...Gorgeous cards! Congrats to her on making it to Round 2!!! This is so exciting! Great cards Virginia! My fav is the last one! 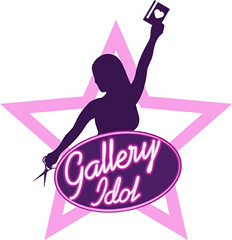 So proud of your gallery idol win!